So we finally made it to the hotel in Kansas, and then left again to get beer and head to the stadium for the game. 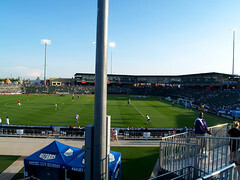 The soccer team in Kansas City, the Wizards, are currently playing in a minor-league baseball stadium while their new stadium is being built. The soccer pitch there is awkwardly squeezed into the outfield of the baseball field, which really means that it's hard to find a good spot to view the game. For the game on Saturday we sat with the Cauldron, the supporter's group for the Wizards. 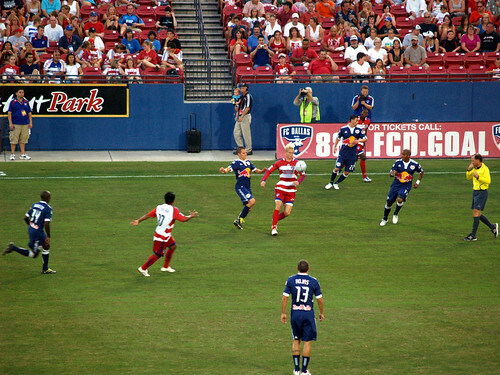 Although I felt like I was cheating on FC Dallas by sitting there, we chose those seats because they were general admission, and therefore the cheapest (but still expensive, the price was jacked up since Beckham was going to be there). We managed to get some good seats with a nice close-up view of the game. Now this presents a little dilemma. The seats provide an awesome view of the players, but you miss a lot of the action on the opposite side of the field. In this game, Kansas City tied it with a true golaso when Claudio Lopez scored on a 50 yard blast from midfield. But we didn't get a good view of it, and I didn't even realize how sweet the goal was until watching the highlights the next day. I really wanted to bring my zoom lens into the game, but read that the stadium there only allows lenses that are smaller than six inches. So as I walked into the stadium, I was stopped at the gate. I had my camera slung over my shoulder, and the lady at the gate said "I'm going to have to check that...." and she trailed off. I thought she was about to say "purse," but I told her it was a camera instead. She inspected the camera and lens, and then asked if the lens was fully extended. It wasn't, but I lied and said it was. She then busted out a tape measurer to see if it passed the test. It did, and just barely. I felt a little bad about lying, but we sat by a few other people with similar lenses that were also snuck in. 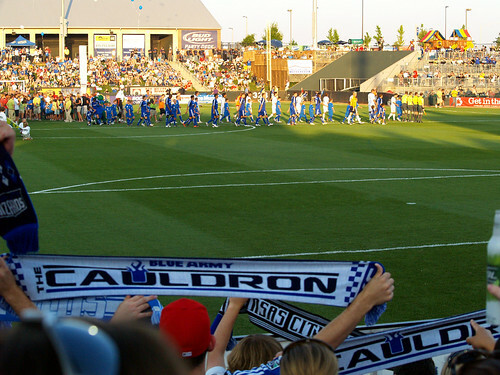 But here is our view from the Cauldron, as the players were taking the field before the start of the game. As the game kicked off, fans around us set off a smoke bomb. This has the bonus of not only casting everything in a blue tinge, but also a lingering smell of sulfur. 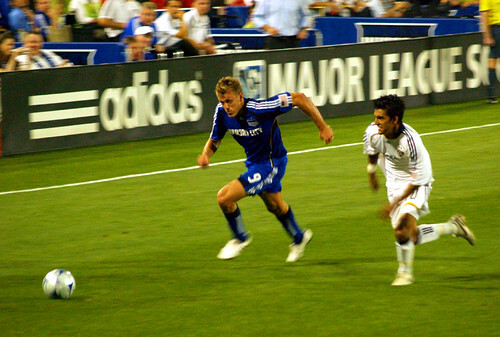 Much of the attention in the Cauldron was diverted to David Beckham, who was the subject of most of the songs and cheers coming from the Kansas City fans. Chants included "Beckham is a wanker" and "We sing better than your wife." 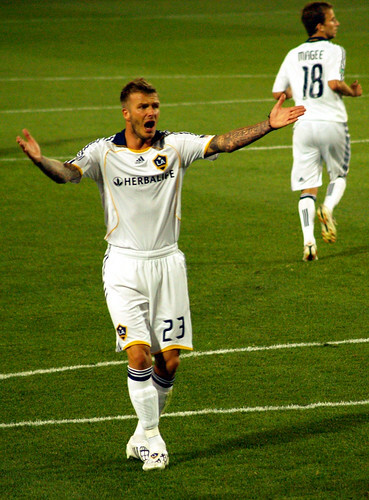 There is a bit of anger at Beckham after some controversy surrounding the English player. I don't know how closely you follow Major League Soccer, but a lot of fans are upset about Beckham stepping out and joining AC Milan, missing half of the MLS season. To make a long story short, a lot of people are questioning his commitment to the team, calling him a fraud and whatnot. It reached a point a few weeks ago during a friendly LA played against AC Milan, where Beckham and a fan got into a fight just before halftime. 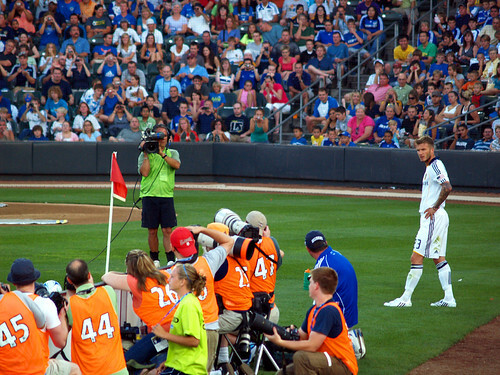 But anyways, here is a shot of ol' Beckham about to make a corner kick, with a phalanx of photographers poised nearby. Here are some more shots of the game, including some non-Beckham ones. I think this one would be better if you could actually see the ball. It's just above the frame of the shot, I think. 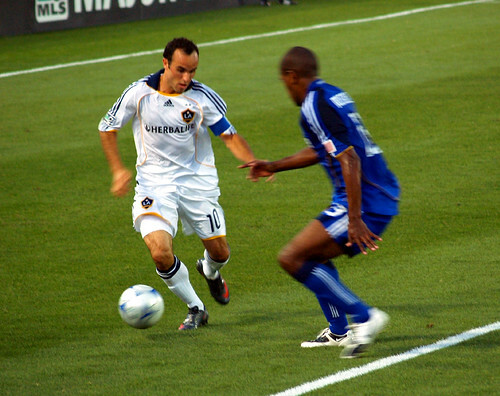 And a shot of L.A. captain (and USA National team star) Landon Donovan. 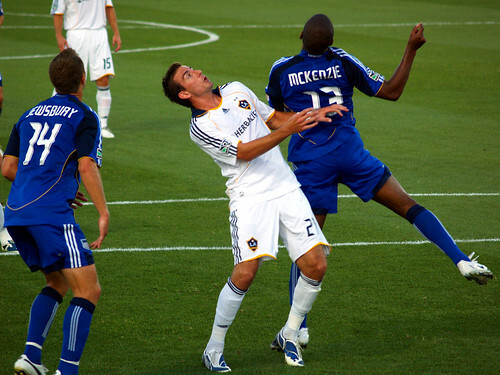 This shot makes me laugh because it looks like Donovan and the Kansas City player are holding hands. 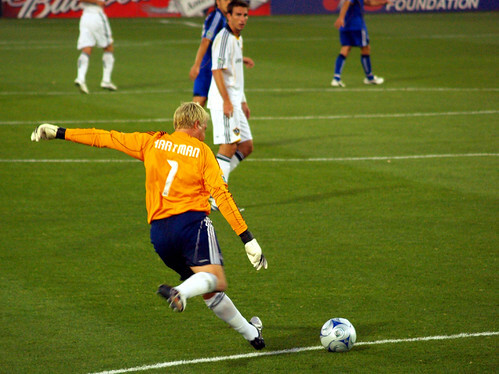 This is Kansas City goalkeeper Kevin Hartman, taking a goal kick in the first half. This game was nationally televised by ESPN2, and at the start of the game a bunch of streamers were thrown onto the field. Most of them ended up at the goal that Hartman was defending, which seemed to get on his nerves. While the ESPN camera was zoomed in on Hartman, they also had a nearby microphone. In his displeasure, he was heard quite clearly yelling "WHAT IS ALL THIS SH*T!" In response, Alexi Lalas, who was commenting on the game for ESPN, dryly said "I don't know Kevin, but we'll get it off the field." At halftime I left the Cauldron and went to use the restroom. I ended up getting a bunch of beer spilled on me by another fan. It was an accident, and he was very apologetic about it and even offered to buy me a beer to make up for it. I enjoyed the free beer but was soaked and my new FC Dallas jersey smelled of beer for the rest of the night. I figured that's what I get for wearing a FCD jersey in the Kansas City supporter's section. More streamers were tossed out onto the field when the second half started. Play was stopped while the players diligently went to clear out the crepe paper mess. 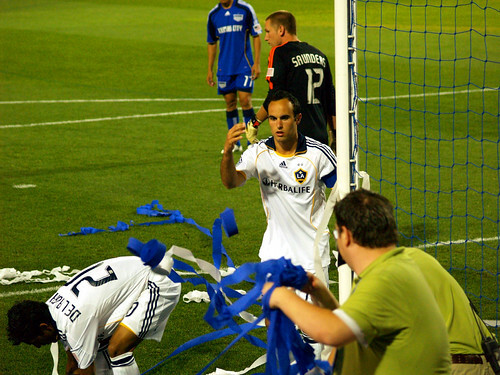 This is Landon Donovan, star of several previous US World Cup runs, doing his part to clear the field. Usually when I go to soccer games I don't sit with the supporter's group. But I had fun sitting with the Cauldron, they added a lot of atmosphere to the game. 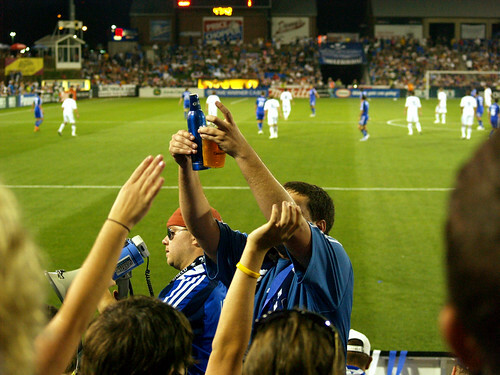 Here is one the main leaders (I guess), leading the rest of the crowd in a cheer, using beer as a conductor's wand. I think that Donovan is trying to tell the rest of the team to get their heads in the game. 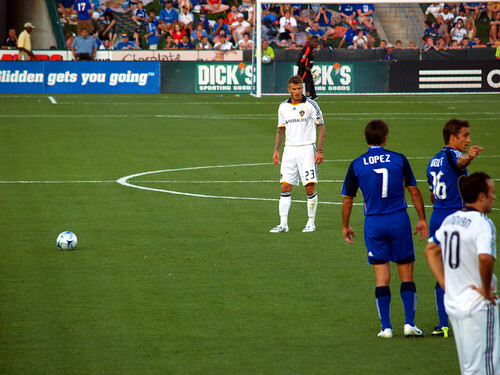 And a few seconds later is Beckham, I think getting angry at a call that went in Kansas City's favor. It was an entertaining game, not just for the circus that was around a David Beckham appearance. 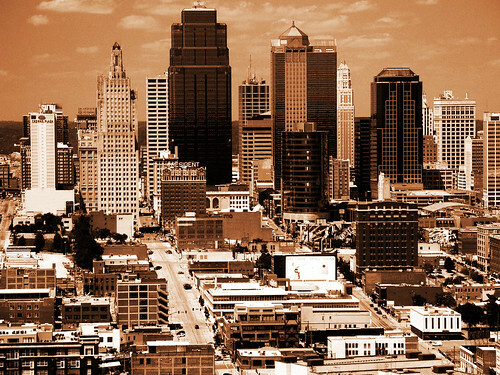 I really like Kansas City (except for the eight hour drive there), so we'll probably be back up there next year. Especially since we didn't get to visit any BBQ places this time. I got the bill for my first car payment in the mail, so I know I should be a bit more conservative with how I spend my money. But that didn't stop me from spending some money on a roadtrip to Kansas City over the weekend. We went up there for another soccer game. 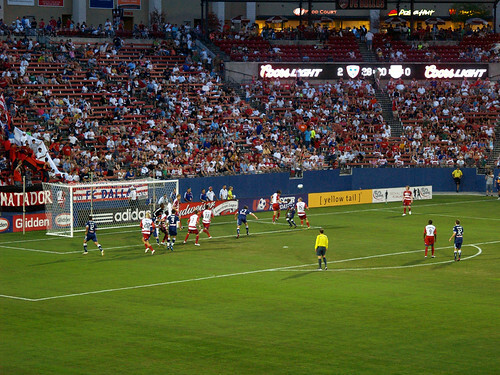 My beloved FC Dallas wasn't playing there (they were getting beat in Salt Lake City). 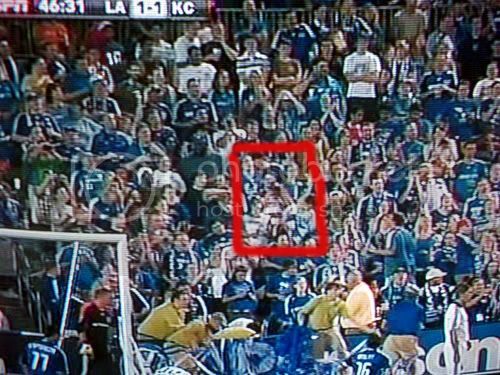 Instead we went to see the circus of Kansas City playing the L.A. Galaxy and David Beckham. We got into town around noon, and went to eat lunch in the Century Plaza area. After that we drove closer to downtown and went to the National World War I Museum. Well, we didn't actually go through the museum, but did go up to the top of the Liberty Memorial Tower. 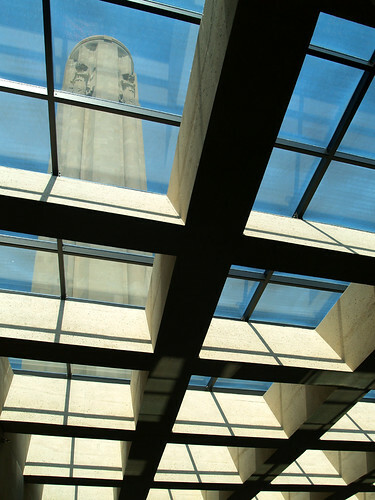 This is the view of the tower from inside the museum, where you buy tickets to go inside. 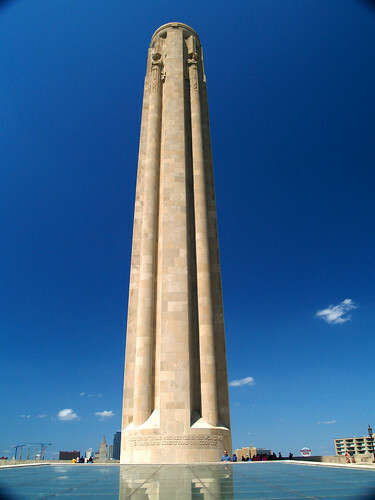 The Liberty Memorial tower was built in 1926, and provides an awesome view of the Kansas City skyline. 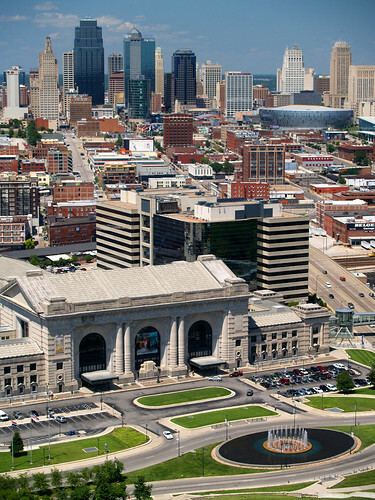 The old building at the bottom is the Union Train Station. And one more view of the tower. There is a guy standing at the bottom of the tower, and I stood to wait for him to move on so he wouldn't be in the way. We both sort of stood there awkwardly looking at each other, me wishing the guy would hurry up and get out of the way. I gave up and took the picture anyways, and walked off. As soon as I did he pulled out a camera and started taking pictures, probably cursing me for getting in the way of his picture. From there we went down the hill and went inside Union Station. 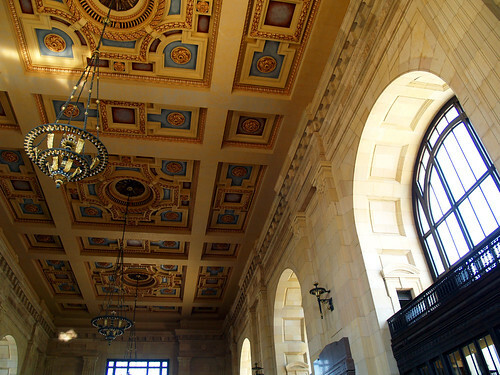 The station was opened in 1914 and was the second largest train station in the country. In 1933, the station was the setting for the "Kansas City Massacre," where four unarmed FBI agents were gunned down by gang members trying to free mobster Frank Nash, who was killed in the gun fight. The station is still used by Amtrak, but seeing the old photos of the station in the heyday of rail travel made me wish (again) that we actually had decent rail service in this country. 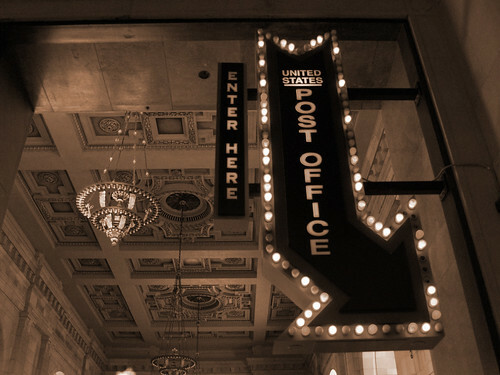 Just like the Union Station in St. Louis, this old train station was converted to a shopping area. But this is the view of the Great Hall, which is 95 feet high. 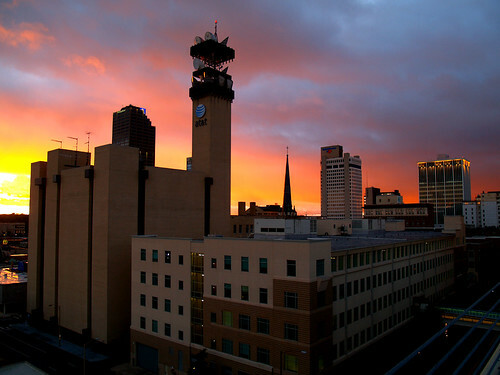 Some of the best views of Little Rock can be found by visiting the many different parking decks across downtown. The elevated view gives a different overlook on the skyline, and you are far enough above street level that you are well removed from any wandering crazy people. 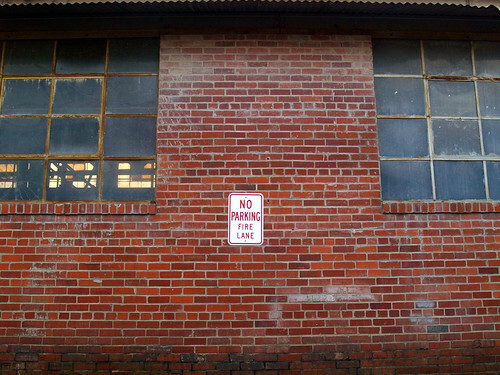 The only problem with this is that I'm never sure if I'm actually trespassing or not. But I decided to try a parking deck that I had never explored before, this one on south Main Street. I had some time to look around before the sunset. 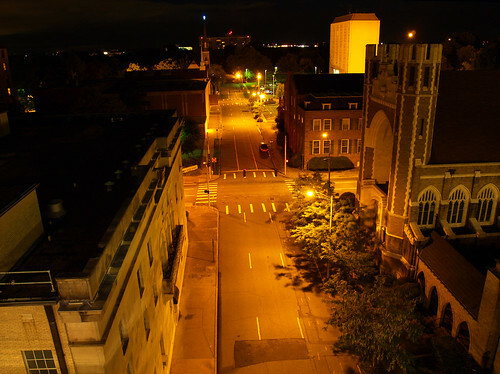 The parking deck here actually straddles Eight Street, and provides this view of the First Presbyterian Church (I think). I thought this shot looked cooler in black and white, which doesn't do much to show how crazy the sky looked before the sunset. 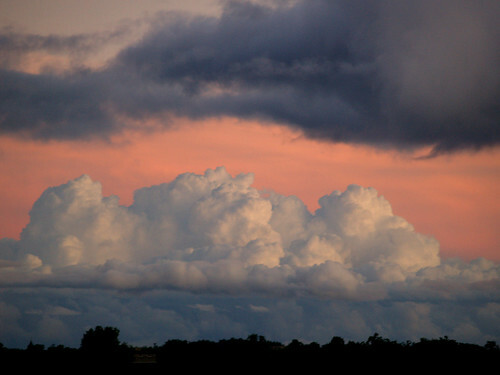 The clouds were several different colors - from dark gray, to pink, to fluffy white. This is what it looked like while facing south. When the awesome sunset (seen in the below post) faded into the blue skies of dusk, I tried for some skyline shots of the city. I wished that the viewpoint would provide a bit more exciting view, but I hoped it would be something a bit different than what you normally see of downtown Little Rock. The building along Main with all the lights on is the home of the state Department of Health and Human Services (I think). It was nice of them to leave all the lights on (since it makes for a more interesting photo), but dang they are wasting a lot of electricity! The building with the tower belongs to AT&T. When I was younger and dumber and I would visit downtown (all that's changed now is that I'm older), I always thought that this was the tower for the airport for some reason. To end the night I moved across the parking lot and got a shot from the opposite end, looking back down Eight Street and the old church. It was really stormy here yesterday. It poured down rain all day, especially at the times when I needed to walk across the parking lot at work. As the storms moved across the state, they caused a waterspout over Lake Conway, and a few small tornadoes. And later that night, the storms caused one of the best sunsets I've seen in a long time. 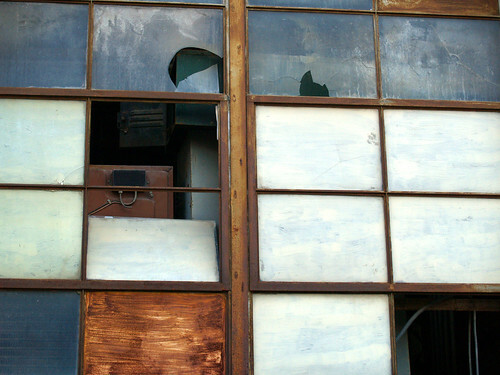 I tried to think of a good place to get some new views of downtown Little Rock. 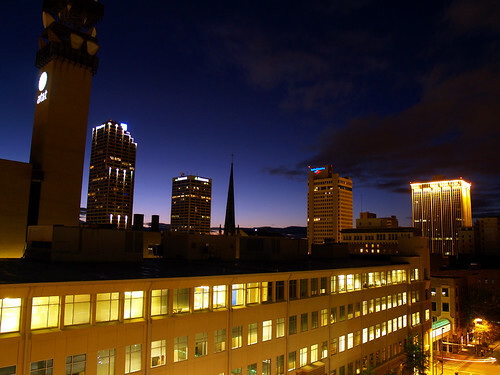 I ended up going to a parking deck along Main Street, which I hoped would offer a nice view of the skyline. I parked the car on the ground level of the parking deck and went to take the elevator, which wasn't working. So I tried to hurry up the seven flights of stairs to the top floor, hoping I wouldn't miss any good light on the way. Of course, later on as I made my way back to the ground floor, I saw that the gates were up and that I could have just driven up there instead. Last Thursday was a stormy day, with some heavy rain falling just as I was getting off work. The bad weather caused some wrecks on the freeway, which meant that it took me an hour to drive home from work. But the storms cleared away the haze and brought along some nice, cooler weather. It also produced some great evening light, and an even nicer sunset. 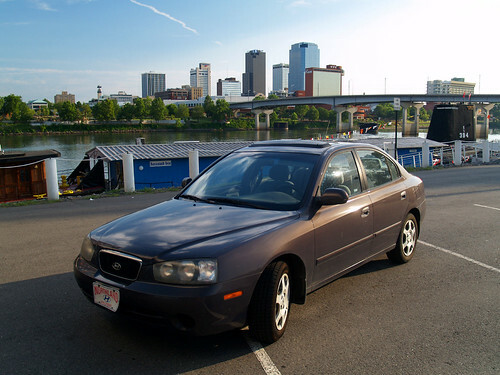 Of course I only saw the sunset in the rearview mirror of the car as I was speeding towards downtown Little Rock. I missed the best light, and drove around town trying to find a place to get pictures of. 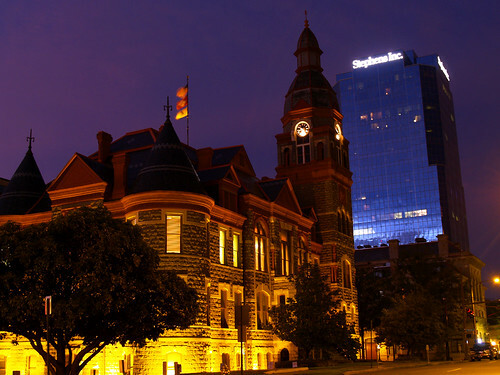 I ended up stopping along Second Street, in front of the Pulaski County Courthouse. 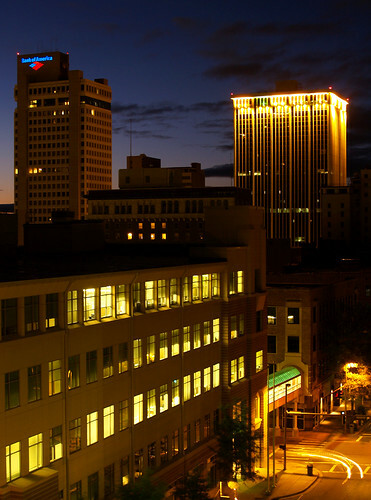 The light from the sunset still lingered in the western sky, reflected in the glass of the Stephens Building in the background. I started to leave, but instead went across the street to a small park that is sandwiched between the courthouse and Broadway. The park has a few rose gardens and an old fountain, but I haven't really visited this little park all that often. The main reason for this is that it is a popular spot for homeless people. Now I have nothing against homeless people, but I do feel a bit wary walking next to someone asleep on a bench so I can get a few pictures. But this night the park was empty, and I tried to get a few shots of the old fountain there. 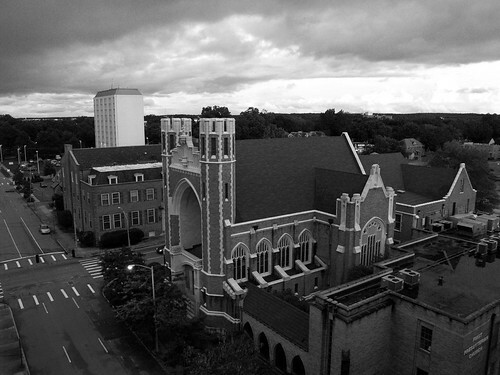 The building in the background is the Robinson Center Music Hall, built during the Great Depression. I've been wanting to attempt getting some good pictures of the stars, and on the radio one morning they said that it was the perfect time for getting to view the Milky Way, thanks to the late rising of the moon. On Wednesday night last week, I set out with my friend John to Pinnacle Mountain. While the conditions were good for looking at the stars (clear skies), it was awfully humid and hot out. Walking to my car that night felt like I was instead swimming through the humid air. Pinnacle Mountain is located just outside of the city of Little Rock, so there is quite a bit of light pollution out there. But I was surprised at the number of stars we could see. My original plan was to go to the Educational Pond at Pinnacle Mountain, which I thought would provide a view of the mountain and the small pond at its base. But a sign at the gate to the pond said that the park closes an hour after sunset. Not feeling all that rebellious, we tried to find a different spot. We ended up just heading down the road to the old Highway 300 bridge. This old bridge sits right on the edge of the park, and there weren't any signs saying that it was closed for the night. Keeping an eye out for snakes and hoping that the flashlight batteries would survive the night, we walked the short distance to the old bridge. I have only tried to do astropohtography a few times, with some pretty poor results. I'm not too happy with how these turned out, either. 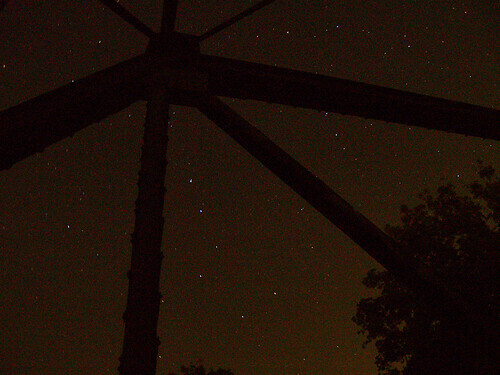 I think I ended up getting more camera noise in the shot than I did stars. 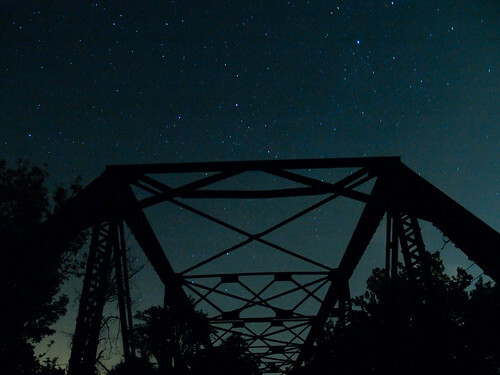 But this is the view of the stars looking up through the bridge. I don't think I had the camera set on the right settings for this kind of stuff. I'm going to have to try again some other time, maybe a place a bit further away from the city. 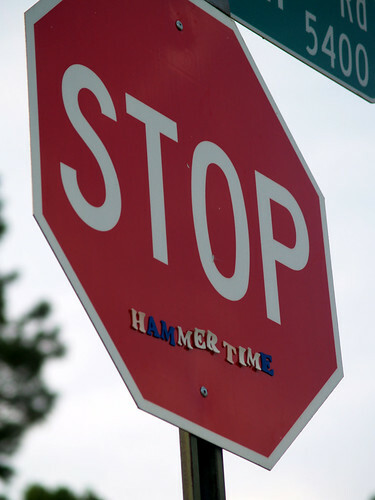 I was just aimlessly driving around downtown Little Rock, looking for something to point the camera at. 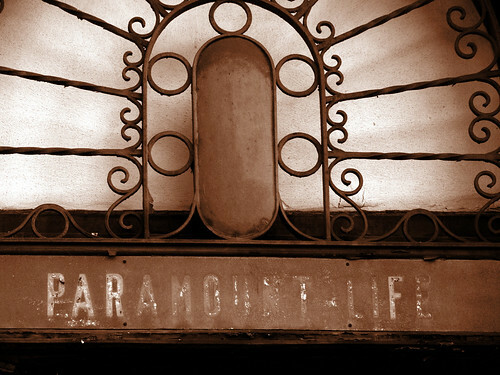 I was driving down Second Street and remembered walking past this old and faded entrance to a door on one of the old buildings. I pulled the car over and got this from the driver's side window. It was getting a bit late in the day, so I tried to think of someplace to get a shot of the sunset. 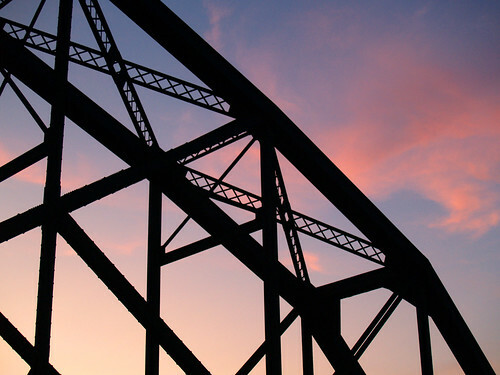 I ended up at the base of the Rock Island Bridge, an old rail brige over the Arkansas River. The sunset wasn't great, but here is a view looking through the old bridge. It had been awhile since I had been out to get any new pictures, and I was starting to go through some withdrawals. 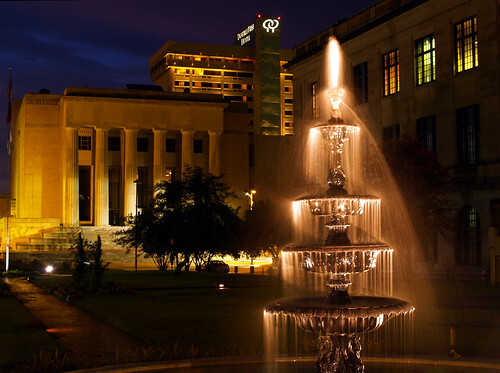 So after work I grabbed the camera and drove aimlessly around Little Rock, looking for something to get pictures of. I ended up heading into the industrial area just east of downtown, and went down this alleyway past a few old warehouses. It wasn't really an alleyway, since the street sign said it was Fairpoint Avenue. 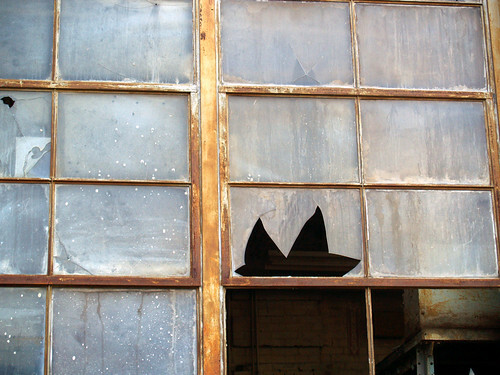 This building must have been an old warehouse, which seemed to be empty and abandoned now. 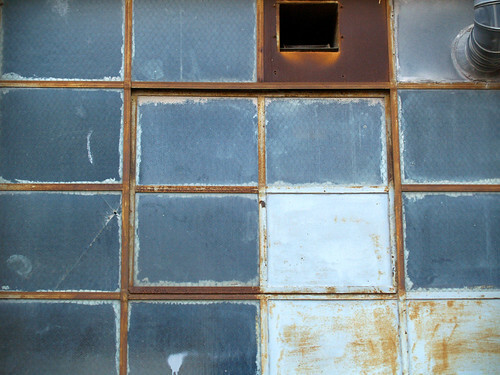 Rows of windows looked out onto the narrow Fairpoint Avenue, and each one was uniquely different. Farther down Fairpoint Avenue was a junkyard-looking place guarded by some guard dogs who came out to bark at the Vibe. Just up the road was a sign that pointed to a Civil War Historical Marker, but it just pointed to a similar looking old warehouse that was closed off by a fence, and I couldn't see any sort of marker. 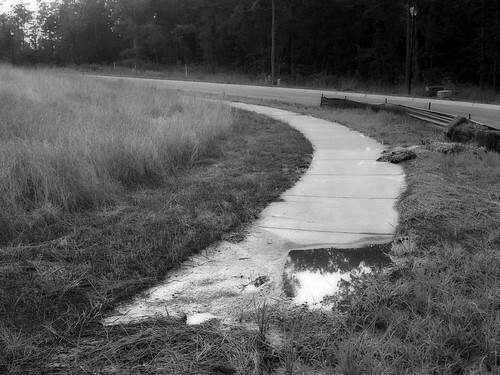 The sidewalk ends, apparently, at this unfinished subdivision in Southwest Little Rock. There are a few other sites in this area - including this nicely decorated sign, which is too legit to quit. The new Vibe wasn't even a day old before it went on its very first road trip. It wasn't great to add on a bunch of miles to the new car right after I got it, but the XM radio came in handy for the five hour drive there. But it was a good road trip. 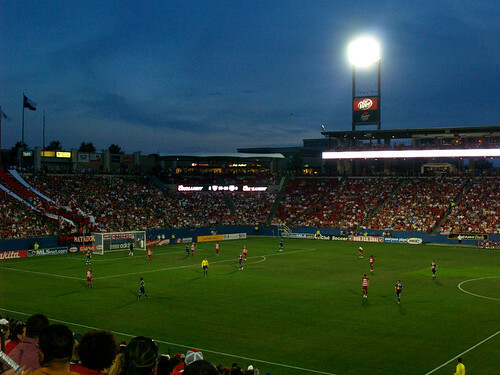 We were there for a soccer game - and FC Dallas actually won the game, beating New York 2-1. I was also able to pick up some Carlsberg, a great but rare beer that isn't available for sale here in Arkansas. It was a good game. Both of Dallas' goals came within a two minute span, during the 15th and 17th minutes. 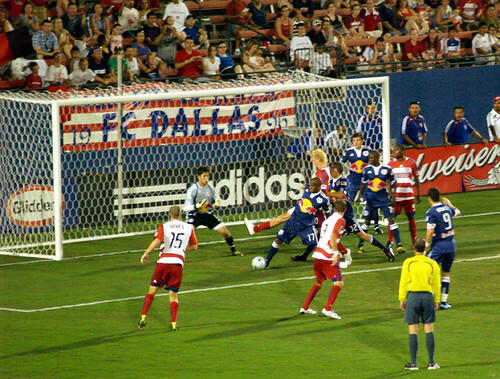 The goals came from FCD striker Jeff Cunningham. Of course, I didn't manage to get any good shots of the goals. New York had a few chances. Here is their top goalscorer Juan Pablo Angel, perched at the edge of the Dallas penalty box, ready to turn towards goal. 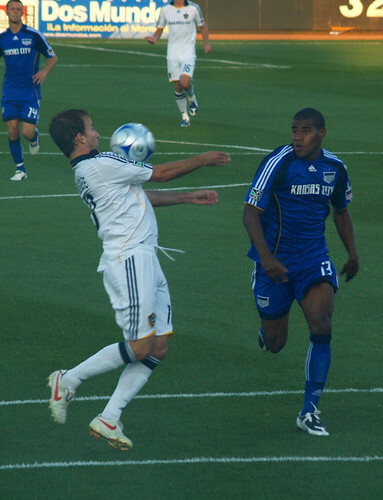 Rushing in to defend are Dallas players Pablo Richetti and Drew Moor, with Ray Burse in goal. While we were in good seats for watching the game, it wasn't the best for getting game shots. Plus, it was dark, which made it a bit more difficult for action shots. Here's our view as dusk settled in over the stadium. 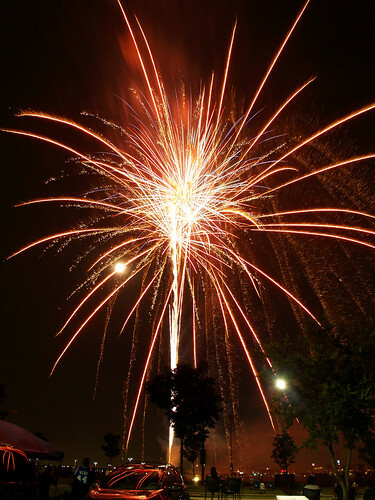 There was a fireworks show after the game, which was billed as the largest fireworks show in the Dallas-Fort Worth metroplex. When the game ended we rushed back to the parking lot and I set up the tripod to get these shots. 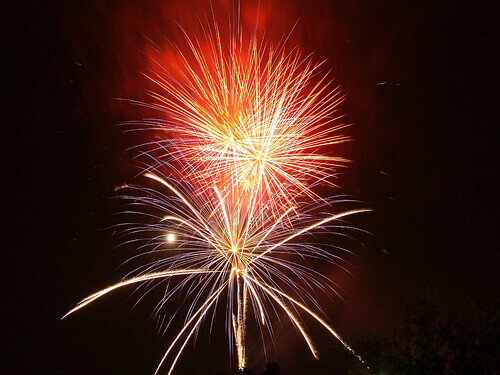 We were close enough to where they set off the fireworks that during the display, we were rained down on by debris from the fireworks. 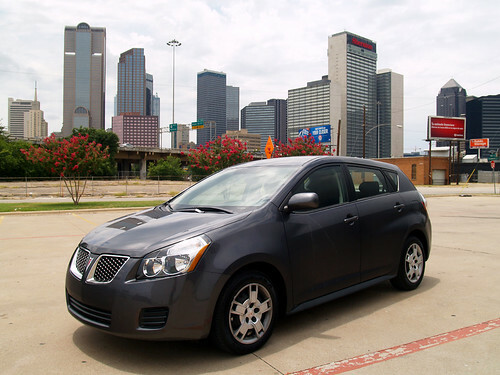 After seven years and 159,954 miles, I traded in my old Hyundai Elantra for a new car. It was a bittersweet farewell, I was fond of that old car. 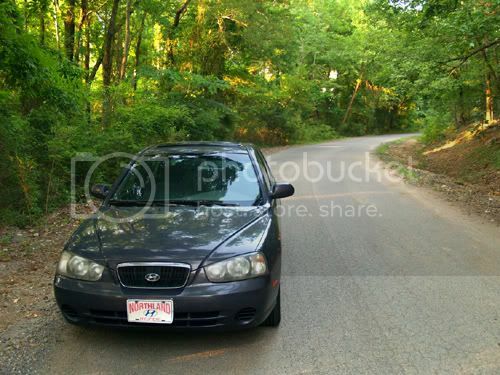 Of course, I wasn't the best owner - I took that poor Hyundai down too many dirt roads, several of which weren't made with little sedans in mind. 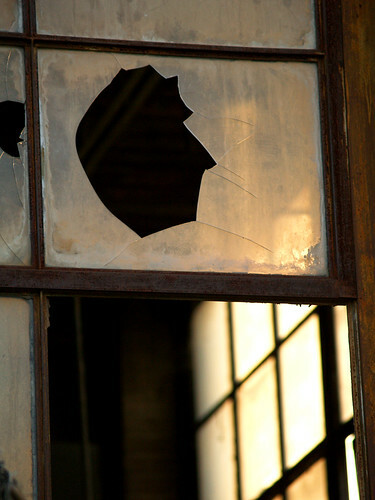 It was covered in dings and dents, although each one told a story. There was some hail damage, for example, which happened during a trip to Petit Jean Mountain. The car looked like it had been through a lot, but it was always sitting there whenever I wanted to take a trip somewhere. The night before I got the new car, I drove the Hyundai around for one last photo trip. This was sort of a "glamour shot" tour for the car. I stopped and got this skyline view, then drove out west to Pinnacle Mountain for one final trip through the woods. The car was traded in for a brand new Pontiac Vibe. It's a really nice car, in fact it's perhaps just a bit too fancy for me. I'm not used to all the bells and whistles that came with it - like satellite radio, for one thing. It'll take me awhile to get used to it. But it was interesting to go from a car with nearly 160,000 miles on it to one that had only a grand total of nine miles. Here is the new Vibe - in front of the Dallas skyline. This was taken earlier today, during the new car's first road trip. 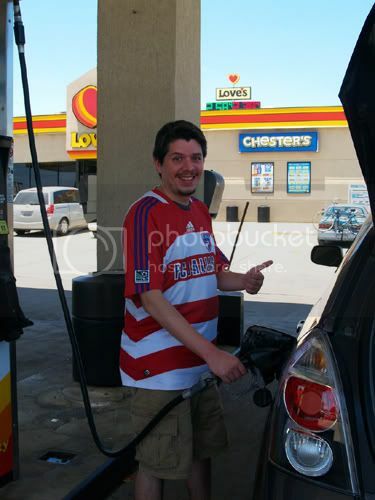 And one last shot, of me filling up the gas tank for the first time. The big downside of the Vibe (along with the car payment) is that it doesn't get as good of gas mileage as the Hyundai, but at least the air conditioner works!